The mission of the Human Genetics Center is to discover how genomic variation impacts the health of individuals, families, and populations and to apply this information to improve public health and clinical care outcomes. We achieve our mission through a commitment to teaching, service, and research. Our research focus is on the human genomic response to various contexts, such as genetic background, environment, or even the genomes of commensal or infectious organisms. Critical to our mission is the ability to understand the behavior of genes in pedigrees and populations. The Human Genetics Center integrates and makes accessible advanced genetics research to the public health disciplines of epidemiology, statistics, informatics, infectious diseases, and public policy. We continue to expand our base of research through interdisciplinary collaboration with other research groups in the Texas Medical Center, in particular other components of UTHealth, across the state of Texas, and around the nation and world. Our vision is to leave no genetic stone unturned in order to improve and sustain the health of all individuals. Understanding the genetic basis of common and complex diseases including cardiovascular disease, stroke, diabetes, birth defects, and retinal degeneration. Mapping the influence of genetics across the course of life from conception to old age. Elucidating gene-gene and gene-environment interaction. Determining the interplay/susceptibility between our genome and those organisms that we “host” temporarily or across the life span. Unraveling the forces that influence the patterns of naturally occurring variation in the human genome. Translation of genetic findings into prevention, treatment, and precision health. Development and application of advanced computational tools for genetic analysis, including those hosted in a cloud-based computing environment. Maintenance of state-of-the-art laboratory and computing equipment which is essential to our research and serves as a core resource for our investigators. The spring 2019 Human Genetics Center Seminar Series will take place Monday afternoons from 3:30- 4: 20 p.m. CST in RAS E-305 at the Houston campus. ITV connections are available to all campuses by request. Download the spring 2019 schedule here. 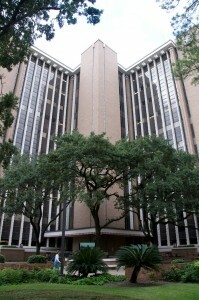 The Human Genetics Center was established as a unit within the School of Public Health on September 1, 1994. It represents the consolidation of two long-standing research Centers that had been joint enterprises of the Graduate School of Biomedical Sciences and the School of Public Health. These two Centers, known as the Center for Demographic and Population Genetics and the Medical Genetics Center, were established in 1971. The consolidated Center has been designated by the World Health Organization as a collaborating center for the investigation of the genetics of common disease. At present, funded research projects focus on common diseases such as cardiovascular disease, diabetes, hypertension, obesity and eye disorders. All have been shown to have a strong genetic component, but the number of genes involved their locations, risk-producing mutations and interactions are yet to be resolved. Center faculty are actively involved in research ranging from completely scanning the human genome for diabetes and hypertension genes to characterizing specific mutations for eye disorders to establishing the evolutionary dynamics of genetic variation in disease genes. The Center is also involved in the assessment of the forensic utility of DNA testing, the establishment of a national DNA testing database for use in research, and the conduct in association with the Department of Ophthalmology, of a laboratory for the molecular diagnosis of inherited eye diseases. In addition to national and international efforts, the Center has maintained a field station in Rio Grande City, Texas since February 1981 to facilitate investigation of common disease problems among the Mexican-American population of Texas. Funding of the Center’s research comes almost exclusively from external sources including the National Institutes of Health, the National Institute of Justice, the Foundation for Fighting Blindness and the American Diabetes Association. Train genetic investigators in molecular and cellular biology and the management, use and analysis of familial and population-oriented data. Provide educational and research opportunities for doctoral students and post-doctoral fellows through employment on externally derived research funds. Understand the contributions of genetic factors to those common diseases that account for most of the mortality in the public health context. Understand the forces that influence the patterns of naturally occurring variation in the human genome, and how those patterns can be exploited to understand human disease. Continue to expand our base of research through closer interdisciplinary collaboration with other research groups in the Texas Medical Center, in particular those located in the Health Science Center's School of Public Health and McGovern Medical School. Seek external support to maintain the state-of-the-art laboratory and computing equipment which is essential to our research. Expand your knowledge by learning how to identify, analyze, and integrate genomic and high-dimensional multi-omic data into population and personalized health with a Genomics and Bioinformatics Certificate from UTHealth School of Public Health. Enhance your education with a graduate certificate in genomics and bioinformatics. The certificate is intended for professionals in academic, clinical, and research settings who are now or soon to be faced with complex genomic and multi-omic data. Students, clinicians, and researchers enrolled in the program will be equipped with a unique set of skills needed to compete and lead in genomic sciences. These skills, obtained through a structured set of courses, will assist students in understanding the advances in human genomics and bioinformatics so that they may apply this knowledge to improve public health and prevent disease. The Genomics and Bioinformatics Certificate can be completed in 12 months if the required courses are taken in three consecutive semesters. Please review the course requirements here and a description of course content here. Online classes are available. For more information, please contact JR Bright, academic and admissions advisor, at JR.F.Bright@uth.tmc.edu or complete the information form here. To elect a certificate, please complete the Election Form. The Completion Form must be submitted in your final semester as part of your graduation checklist or earlier if the certificate requirements have been met. Submit the online application via SOPHAS Express. Transcripts (applicant may upload official or unofficial transcripts that lists the degree awarded. If the applicant is admitted, an official transcript must be submitted to the Office of the Registrar. For more information on admission requirements, please visit the certificate webpage here.